The United States of America comprises 48 mainland states bounded by Canada and Mexico, plus the outlying states of Alaska and Hawaii. Young in tradition but high in ideals - democracy and liberty being the twin guiding lights - America has a huge land mass which is not overpopulated - although, of course, population is dense in the high-rise cities! Apart from being a huge country, the United States of America is not horizontally challenged with population because of their inclination: to the vertical challenge! Yes, why waste ground when everyone can live on top of each other? Build-em high, that's the motto there. Although it works, it does give rise to a huge density of people and vehicles down on the ground where they live. Guess they didn't figure that one out. Strange, then, that Americans don't think much about distance. Hot and dry: that's Nevada ... and Arizona. Hot an dry: that'll also be you, unless you keep drinking your water. Right in there, hardly noticing they are surrounded by desert, is Neon City: Las Vegas! This was the start of a trip to the west coast. After a brief spell among the neons and a short flight across Hoover Dam and Lake Mead to the Grand Canyon, I crossed Death Valley and headed for the oasis resort of Palm Springs: first stop in California. The stop-off in Nevada and Arizona was, however, the start of a long sequence of contrasts. It's nice to share them with you. If you haven't been to the US, then perhaps this might just make you want to change all that! Amazingly, Synergise have been unable to find a web site which adequately provides a picture of this very visual city, and so I have unusually been permitted to use more of my photographs than usual. Even then, I've had a job to restrict myself. Just a glance will show you that it would be impossible to adequately do justice to Las Vegas in mere words. They build casinos... in a very special way in Las Vegas. They make them easy to enter but difficult to leave. It is a very sad city, of course, when you come to analyze it. Who can really admire an ethic designed to extract millions of dolllars from gamblers only to spend it on glitz and buildings, when there are so many better causes? Having said this, however, the city architects have created a heritage which one might also say borders on the eighth wonder of the world. For here you will see a modern answer to the pyramids that is just as amazing, a tower as tall as the Eiffel Tower in Paris, the spirit of Paris itself, shades of Venice complete with the Realto Bridge, a transplanted New York syyline, and various other themes created in the form or architectural edifices. All this is a shell for the casinos, of course, but even as a non-gambler, you cannot help but admire these unsung, architectural masterpieces. So I take it from there. There are some worth singing about! The picture shows the exterior of the hotel and casino complex which goes by the name of New York New York. If you think the name is over the top, then you'd better get used to everything being over the top in Las Vegas! I start with this so that you can get into the spirit of the place. 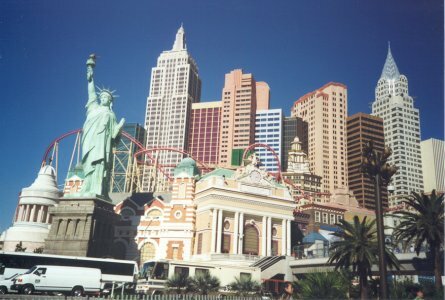 Here the casino has externally created a skyline meant to represent famous landmarks of New York: including the Statue of Liberty and the Empire State Building. And those interconnected mini-skyscrapers are not wasted: they contain hotel rooms. 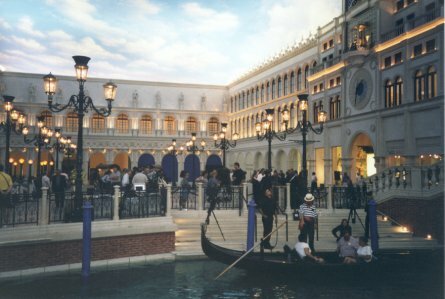 A typical casino complex in the city contains several thousand hotel rooms, and the Venetian, yet to be fully completed, will have something like 6000! So, as you can see, all these people bring more than a little cash to the 'Entertainment Capital of the World'. 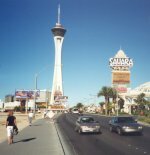 I stayed in the Stratosphere hotel and casino. Over the top? You could say so! 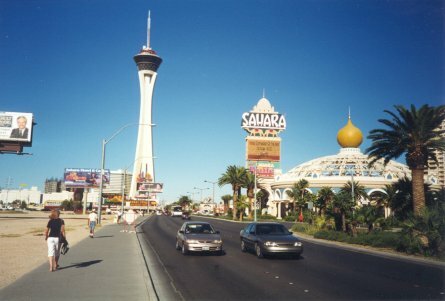 With three main buildings, one of them the 100-storey Stratosphere Tower. This is just over 1,000 feet high, the highest observation tower in the US. This is as tall as the Eiffel Tower, but only in Las Vegas would they dream of putting a roller-coaster ride around the top. Oh yes, and another thrill ride which catapults you some further 100 feet up a mast pulling in excess of 4g, before gravity-falling beneath your pants. I actually rode this roller-coaster: so that I could report back to you, of course! The nice lady told me it went round nice and gently so that you can admire the view. Well, let me tell you, with the evening lights of the Strip laid out so far below through what appears to be open space, and no evidence that you are connected to the tower, there is little time to admire the view as you career, weave and dive around the top. True, as roller-coasters go it is tame - no loops for example - but at 900 feet above sand-level, is can still thrill ... or chill! Anyway, I did earn my 'Scream Team' badge as a result! They build casinos (let's just use the word 'casino' for short when I actually mean a casino and hotel complex) in a very special way in Las Vegas. They make them easy to enter but difficult to leave. The latter is achieved by confusing, rambling internal design and no exit signs. They dream up new ways of getting people in but keep up the old ways of keeping them in: confusion, keeping daylight out, total absence of clocks, and endless arrays of slot machines ready to take your last dollar: or nickel. The Stratosphere followed these principles and it was even difficult to remember how to get to the hotel elevators or the restaurant. To help you to get a grab on the scale of these casinos, it typically will take at least 15 minutes to walk through the ground floor in the nearest thing to a straight-line you can manage. It's not all gambling, either, although there is no shortage on places to undertake this, as you can imagine. 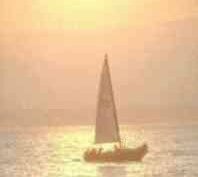 Take Treasure Island, for example. 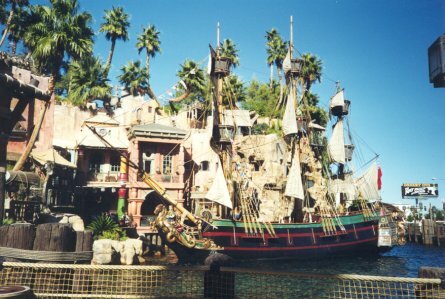 Here two enormous galleons sail upon a coast scene constructed outside the front of this casino, and you can watch acted pirate battles here several times a day! This is just to get you to the outside of the casino in the hope that you'll go inside. New York New York had the same idea with their exterior, but they keep it up on the inside, and you walk through sidewalks with cafés and steaming manhole covers to get through to the gambling area in the centre - which really brings you down to earth. 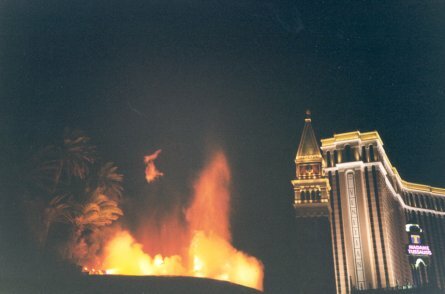 Nearby, the Mirage has a regularly erupting volcano of water and flame, as shown left. It even looks as though the flame comes through the very water. In between times, this area looks like a fairly conventional fountain. (Fountains here can be rather ambiguous!) Looking across the strip from the viewpoint of this photograph you see the new Venetian casino: soon to be the largest hotel on the strip. The exterior of this is an architectural masterpiece catching the Doge's Palace and the Rialto Bridge to perfection, complete with canal. Then inside, on the first floor, best approached over the Rialto Bridge, you'll find a complete Venetian scene, a morsel of which is depicted in the picture to the right. To get to this area you walk down passageways alongside a canal, complete with working gondolas, passing a canal-side café. In contrast, but thankfully well separated, on the floor beneath all this is a vast room full of slot machines! Enter at ground level and you would never dream what lies above! What I am trying to show here is that there is far more to Las Vegas than meets the eye. Sure, there are enough neons and light bulbs to light a small country - one of the signs on the strip alone takes enough power for a small town - but the architecture and the internal masterpieces make it a worthwhile place to explore if you don't even risk a dollar gambling - or approve of those who do. 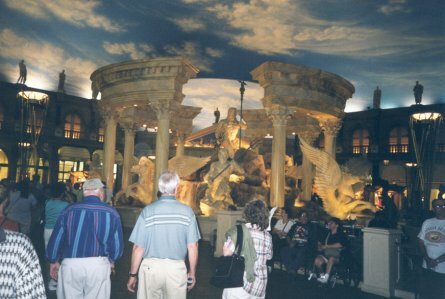 Of all the casinos, it was Caesars Palace which will stay in my memory best, and this is a good example of how you can completely miss something if you judge it by the slots you first see through the entrance doors. Penetrate through a hall of slots in Caesars Palace, if you are unfortunate enough to come through the door that I did, and you reach ancient Rome flanked by modern, up-market shops. Above you is a fantastically realistic blue sky, complete with fluffy white clouds, and 'ancient stonework' surrounds you. Two shows - one about the Fall of Atlantis - regularly impress the crowds with their laser, water and pyrotechnic displays, but more creepy is the atmosphere created in this vast place which really does seem to be out of doors. The fantastic sky can be transformed slowly from day to night - and then back again while you shop or eat 'out'! A truly amazing achievement. Don't miss this! There is so much more I haven't got space for: like the Egyptian. Imagine an enormous, smoke-glass pyramid of a hotel with a light so powerful at night that its upward beam was judged to be a navigation hazard: mainly because all the passengers in plane landing at the nearby airport would want to get up and cross to one side of the plane to see it better! Then go inside, penetrate the slots, and you see around you ancient Egyptian architecture and, breathtakingly, the inside of the pyramid with its inwardly sloping walls, vast open space like the inside of a cathedral, and balconies stacked above you on the four walls to provide access to the hotel rooms; any figures on the top balconies are hardly visible they are so high. How can you not be impressed by such architecture? Why, even the ancient Egyptians couldn't have built this! All this is on the main strip is relatively new. It is not part of the old city. Here, too, you will find the instant marriage-parlours, the marriage drive-thru, a marriage chapel, etc. After all, there's not much time to spare in Vegas! 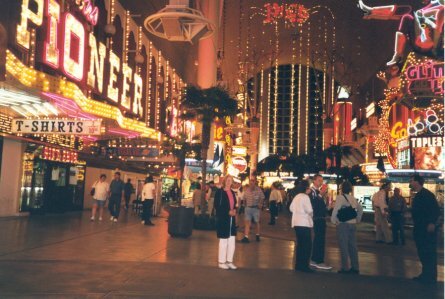 Go downtown, and you see the famous kicking lady, the Pioneer, and downtown's answer to the light-show that is the strip: the Freemont Street Experience. The downtown casinos 'chipped-in' to pay for this display to bring the punters back to the strip. On the appointed hours the casino lights click off and the entire street above lights up to a moving sound and light show. (What is shown in the picture on the left is transformed to something like that shown on the right.) 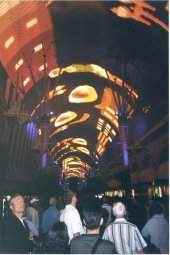 An arched framework running the entire length of the street, and containing millions of light bulbs, provides this moving tapestry of light - which is like a giant screen linked to the changing sound-tracks. Hard to believe it is all outdoors! Not hard to believe it could only be happening in Las Vegas! 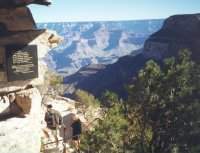 Finally, when you get bored of the glitz, provided you've saved quite a few dollars, why not take a trip to see the Grand Canyon or Hoover Dam? 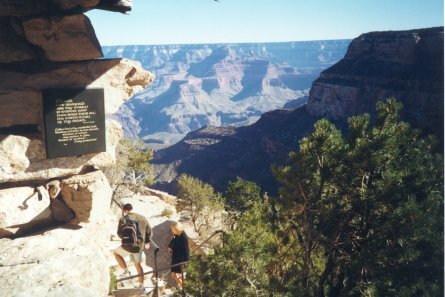 There are many alternative trips to the Grand Canyon to choose from. I took the Scenic Airways 19-seater plane to land near the Southern Rim, and their included bus trip to a couple of locations on the rim: with lunch thrown in. This was not a gastronomic feast, but it did keep me going. Although more expensive than a simple fly-over trip, I would strongly recommend that you land: for you cannot truly experience the Canyon from the air: you miss out on some awe! You could cut costs, if you've got the time, by taking a bus tour there: but it is a fair old way! I can tell you: this place is silent and breathtaking. Now, firstly, I must confess to feeling churlish to put up so few pictures of this far more awesome feat created by Nature than that created by man in Las Vegas, but this is entirely justified: the linked web site contains dozens and dozens of fabulous pictures, far better than my own. The flight from Las Vegas across Hoover Dam and Lake Mead was interesting but cramped. Not that you can expect much else from an aircraft only designed to seat 19 passengers. Its extra-large windows made the experience much more worthwhile, as the great expanses of the Canyon spread before us: or should I say: below us. We experienced some turbulence, and you must expect this, given the fact that it is hot out there and thermals and winds do tend to get diverted a little by sheer canyon walls. I was quite glad I did not opt for a helicopter flight in the Canyon for I do suspect this can require a little more calm from its passengers. Here are a couple of pictures taken from different viewpoints on the Southern Rim. I might add that you are privileged to see these at all, since I was nearly prevented from taking them. My camera then went on the blink in the aircraft, so my first port of call before gawping across the Canyon at the first ground stop was the gift shop: I needed new batteries urgently. They were fresh out! Wouldn't you know it? I come all this way to take pictures for you and they are fresh out? What bad planning they have! I did find another smaller gift shop and they - bless them - managed to find some: the very last they had in stock! And here are the results, once I had enough electrons to power the shutter. Great view, or what? 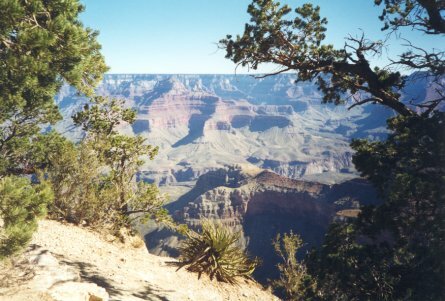 Click the camcorder symbol above to watch a video about the Grand Canyon. Click the camcorder symbol above to watch a video about Las Vegas. If you enjoyed reading the above article then you will probably also enjoy Tunisia by Ed, and California, also in North America, and our latest articles covering the Orinoco Delta, La Mata, Marbella and Beijing.